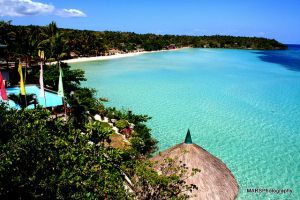 The Philippines is considered to be predominantly Catholic. However, a different religion dominates the southernmost regions of the country. Islam is a monotheistic religion that’s articulated by the Qur’an. Much like the Bible, it contains the word of Allah (God). But there are also references to the teachings of Muhammad, whom adherents consider the last prophet. Muslim is the name given to adherents of Islam. Meanwhile, these people dominate the Sulu Archipelago, which is composed of the island provinces of Basilan, Sulu, and Tawi-Tawi. Islam has flourished in the country for over 500 years. Muslims are recognized in history for putting up a successful resistance against the colonizers. Had these forces from the West not been able to penetrate and take over other areas, the Filipinos’ way of life would be quite different today. Despite being a minority group, Muslim beliefs, traditions, and practices are very much a part of the nation’s cultural fiber. 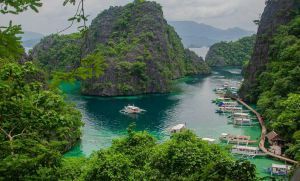 These are evidenced by the impressive mosques or masjids built in different parts of the Philippines. Indeed, a foreigner’s visit would not be complete without seeing a few (or all of these beautiful places of worship. Unsurprisingly, most of them can be found in Mindanao. 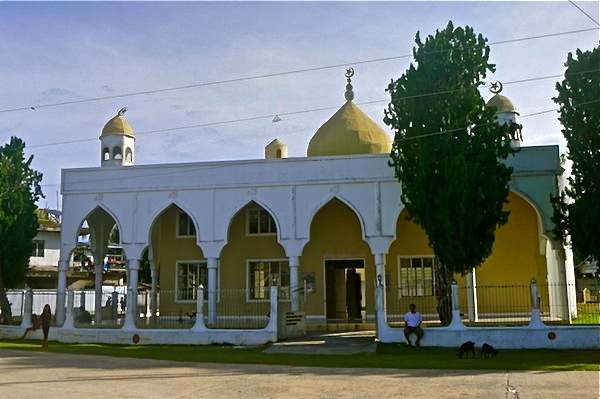 This striking mosque in one of the districts in Zamboanga City has been around for well over a century. Built in 1885, it is the oldest masjid in Western Mindanao. It was constructed by Hadji Abdullah Maas Nuno, chieftain of Sama Banguingui. His remains can be found at the back of the structure, where there’s a clear view of the red onion-shaped domes. This building’s size and scale awes both Muslims and non-Muslims alike. Prominent features include gold-plated domes and minarets towering over 40 meters above the ground. The area it’s built on is immense too as it covers a sprawling 5,000 square meters. 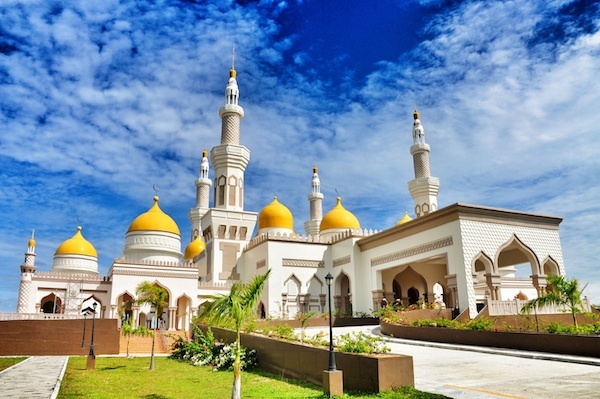 Completed in 2011, the construction of the Philippines’ largest mosque was partially funded by the government of Brunei. The total budget is said to be over 40 million US dollars. The build is also in line with the Peace and Development Project in Mindanao. Non-Muslim soldiers co-maintain and protect this beautiful edifice, making it a symbol of peaceful co-existence amongst religions in the country. The first mosque in the Philippines is older than any Catholic Church. This masjid in Simunul was built in 1380 and named after the Sheik Makdum, an Arabian missionary. He introduced Islam and supervised this particular project. He was laid to rest within the building’s premises. It might be well over 600 years old, but the wooden pillars from the original structure are still standing. This candy colored edifice features a bright pink façade. This brilliant hue was chosen because it represented peace and love. The mosque’s construction was initiated by Datu Saudi-Ampatuan Mayor Samsudin Dimaukom, in the hopes that it will show another image of Maguindanao. It can be recalled that the province was shadowed in violence some years back.